Completion of the final two elements of CityCenter have been delayed. The Veer Towers condo units will begin closing in May. The condo units were scheduled to sell earlier in the year. 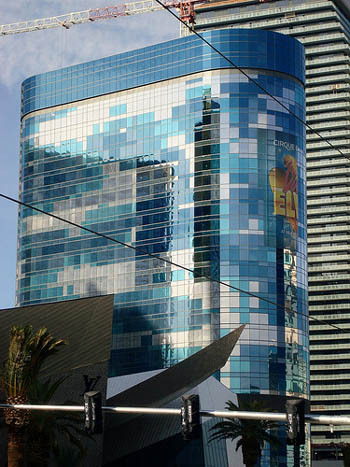 According to MGM Mirage spokesman Alan Feldman, "The closing date was modified to accommodate a large number of interested buyers wanting to participate in our seller financing program, which was just announced this past December." 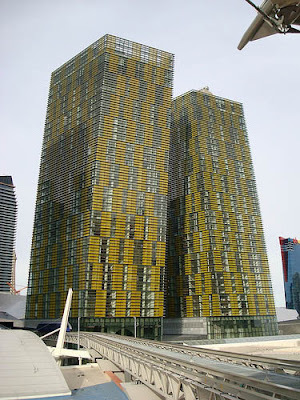 The Harmon Hotel on the other hand is delayed indefinitely. Said Feldman: "Harmon Hotel has been postponed until such time as CityCenter determines to proceed with its completion." It had been speculated ever since CityCenter opened that MGM Mirage would hold off completion until their financial situation improved. Source: Las Vegas Business Press.